I’m a Dutch freelance narrative designer and writer. My biggest project to date was writing Castaway Paradise, for Stolen Couch Games. * I’m currently looking for new assignments, so don’t hesitate to contact me! * You can find me on Twitter: @wpboon, or email me: hallo at wpboon dot nl. Doesn’t have to be about assignments. Could be about hot peppers, Connan Mockasin, or trading ‘Asterix and the Twelve Tasks’ references. Talk to me! 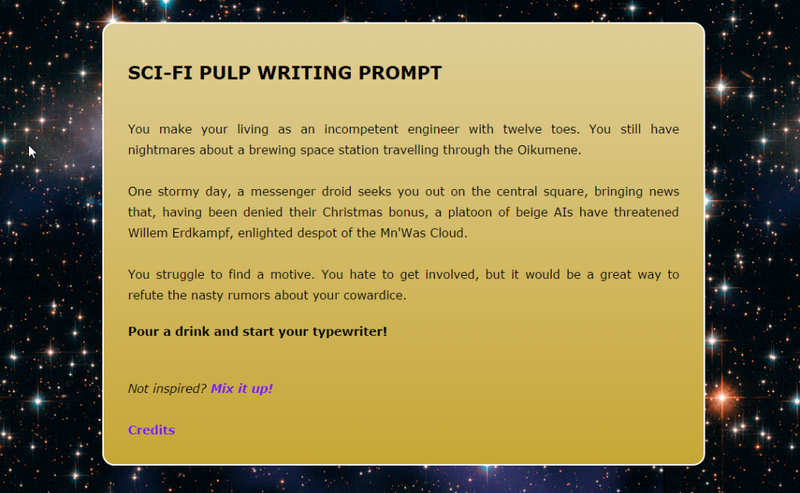 Wrote my first Twine game, Sci-fi Writing Prompt Generator. You can play the game on Philome.la. I’d heard about narrative game engine Twine before, and really enjoyed the work of @webbedspace, for example. But I hadn’t gotten round to using it until now. For my first game, I wanted to try out some syntax things. Not focus on the storytelling part so much as on the system’s capabilities for randomness (being inspired by procedural generation in other video games). My next Twine game will be a more traditional narrative with some puzzle elements, though, so if that’s your thing, stay tuned. Castaway Paradise is a life-sim in the same vein as ‘Animal Crossing’ and ‘Harvest Moon’. The game was developed by Stolen Couch Games, over the course of 2 1/2 years. They’d been working on it for a year when I joined the team as a narrative designer. With a friend, I made a pseudo-documentary, called ‘Zo zijn de regels’ (69 min.). In it, Hans van Ree (played by poet Daniël Dee) consciously avoids all order in his life. A film crew follows him on a typical day. ‘Zo zijn de regels’ was shown in multiple student theatres.